Dry Cured & USDA inspected. No refrigeration required. Bones are salt cured. Ideal for medium to large dogs. This product is not intended for human consumption. Made in U.S.A. 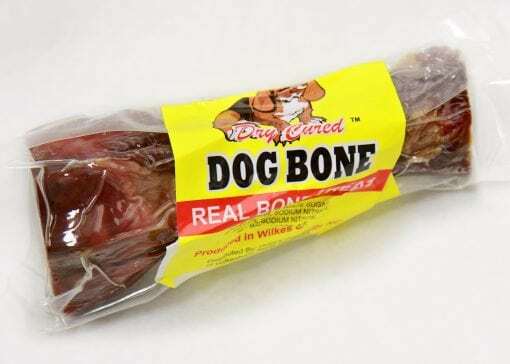 Always monitor your pet while consuming any natural bone. Remove bone and discard if splintering occurs. Salt Cured product, provide pet with plenty of water during consumption. Dry Cured Country Ham Bone. Cured with Salt, White Sugar, Brown Sugar, Sodium Nitrate, Black Pepper, and Sodium Nitrite.